In 1985, Pécs saw the foundation of the first civil organisation of Germans of Hungary after World War II: cultural society Nikolaus Lenau. The association’s two main goals are: firstly, to strengthen the identities of Germans of Hungary, to use and sometimes even learn the German language and to maintain cultural traditions and secondly to function as a cultural bridge between Germany and Hungary. Lenau House, in which the society resides, was built between 1987 and 1989 with the aid of German state funding. A bust of Nikolaus Lenau, designed by the sculptor Jenő Hanzely and produced in the Zsolnay manufacture in 1972, was later placed in the garden. In the yard, the work “Displacement of the Germans of Hungary” by Pécs sculptor Ferenc Trischler can be seen. The work was unveiled in May 1997 by Árpád Göncz, State President at that time. Leanau House offers various cultural events and exhibitions. 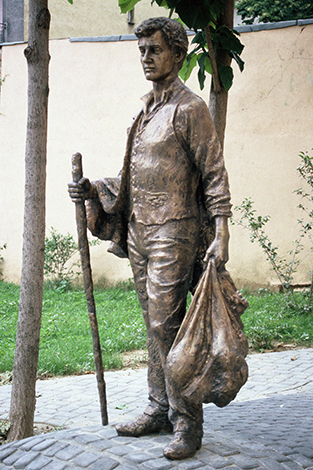 „Displacement of the Germans of Hungary“, artwork by sculptor Ferenc Trischler from Pécs.